So it seems that I have a bit of a shiny thing disorder. In other words, I am easily bored and in search of something new and different all the time. You may have figured that out about me, but this challenge is proving it to me. I like to learn. “Well, you have done three days of paper collages, won’t you continue your study of them all month?” you say. 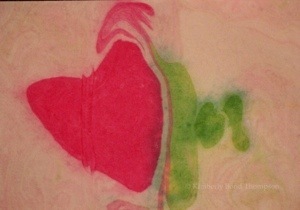 Now in all fairness to myself, I went in search of some alcohol ink tutorials on youtube. You know my love of them. 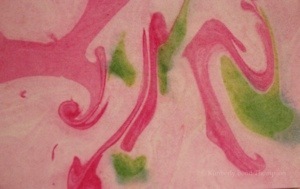 What I found and absorbed was paint marbling techniques. They are very cool. So off to the store I went. Hey. I had to go out anyway… No judgements! I did not find any of what I was looking for, alcohol ink or otherwise. So, I did what I also like to do and I dropped back and punted. With some cool liquitex inks in hand, I improvised and had some fun! 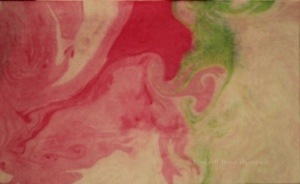 What I did for the technique was attempt to float some pigment on water, similar to what I did with the alcohol ink cards I made. Got a tad more float, but not much. It sure was fun to try to control the ink by applying it to the water with the tip of a brush. But alas, I had seriously no control. I made probably 10 different versions in short order. Now, I realize that this doesn’t quite count as a “painting” for today, I am chalking it up to a “could have been” if I had a clue… And the right materials. Sure was interesting to try and was so cool to watch the results appear. Honestly, I think 30 in 30 is as much about exploration as anything else. The big question is… Can you tell what I was trying to create? You are gooooood 🙂 Pink and green… sort of a give away huh?! Kim! Love this, boy do I wish we lived closer so we could experiment together! What kind of paper did you use? Good for you, what a fabulous way to spend the 30 in 30, new year, new applications, learning…love it! !